Tom joins the team straight out of school and has a passion for business and providing clients with first class customer service. Tom has recently completed his Level 2 NVQ with Truro College and has now progressed onto a Level 3 NVQ. 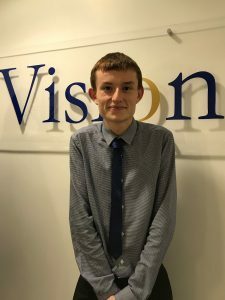 Tom has been with Vision for over a year and is excited to progress onto his new Apprenticeship. In his spare time, Tom enjoys long walks in the beautiful Cornish countryside with his friends and has a keen eye for Photography, taking every opportunity to capture beautiful images across Cornwall.